June 2011: Tourneau starts selling Chanel watches at two NYC stores. August 2013: Cartier CEO Stanislas Chauveau De Quercize tours the TmeMachine and threatens to stop supplying Tourneau with watches unless Tourneau closes the Chanel Boutique at its TimeMachine location. September 2013: Tourneau tells Chanel that it is terminating its agreement to build the boutique. December 2013: The boutique is dismantled and is not used by Tourneau. Instead, it is used to house Christmas trees and a reindeer. December 13 2013: Chanel files a suit against Tourneau and Cartier in New York State Supreme Court, seeking over $15 million in damages. Click here for the Wikipedia entry on Chanel. Click here to view a selection of Chanel watches. Click here for the Wikipedia entry on Tourneau. Click here to find a Tourneau location near you. Click here for the Wikipedia entry on Cartier. Click here to view a selection of Cartier watches. Chanel has revealed a new timepiece to commemorate the 10th anniversary of the popular Chanel J12 and it is a diving watch. 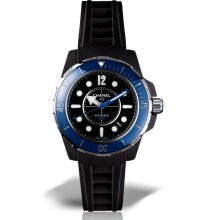 This J12 marine is a veritable diving watch that can withstand the pressures of underwater environment up to 300 meters.The J12 Marine watch ranges in price starting from $5,000. This luxurious timepiece is stylish as well as functional. The watch comes in two different size ceramic cases; a 38 millimeters and a 42 millimeters case. Both are good sizes and should be suitable for people with different tastes. Both sizes also come in three versions, which include an all-white, all black, and black and blue. The all black with black bezel is only available in 42 millimeters case. The all-white version has a glossy finish, while the all-black is bead-blasted for a matte finish. This timepiece has a high-strength anti-reflective sapphire crystal that covers the entire watch face, including the rotating diver’s bezel. This unidirectional rotating bezel is graduated to 60 minutes and is easy to read the immersion times. Inside this case is the movement that powers the watch, which is the mechanical Swiss automatic movement that has 42 hour power reserve. The dial of this watch is available in either black or white lacquer and has strong luminescent hour marking and hands for easy legibility. There is a big arrow for the hour hand and a blue baton hand for the minute and second hands. The hour markers are easy to read as well and look nice against the dial background. The matte rubber bracelet is the perfect finish for this Chanel J12 Marine watch. It is waterproof, vented, shock and UV-resistant. This rubber comes in black or white depending on the version of the watch. The clasp on the bracelet is satin-finish ardillon buckle. 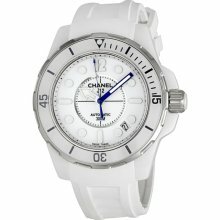 Check out our collection of Chanel J12 Marine 300M watches here. As you can see, there are many suitable timepieces to wear to a wedding and it basically comes down to your individual style. These watches are extremely fashionable and timeless and would be a fabulous accessory to wear to any formal event. 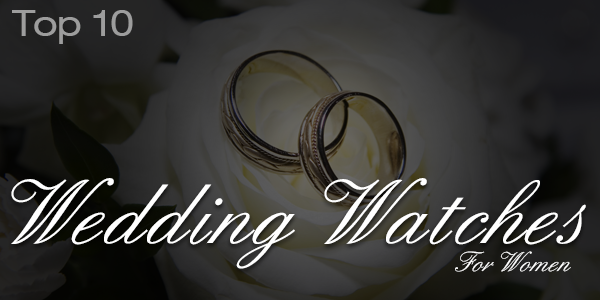 Watches make the ideal embellishment to wear to a wedding to look chic without losing track of time. Chanel is using the new iPad to market its latest diving luxury watch series, the J12 Marine. 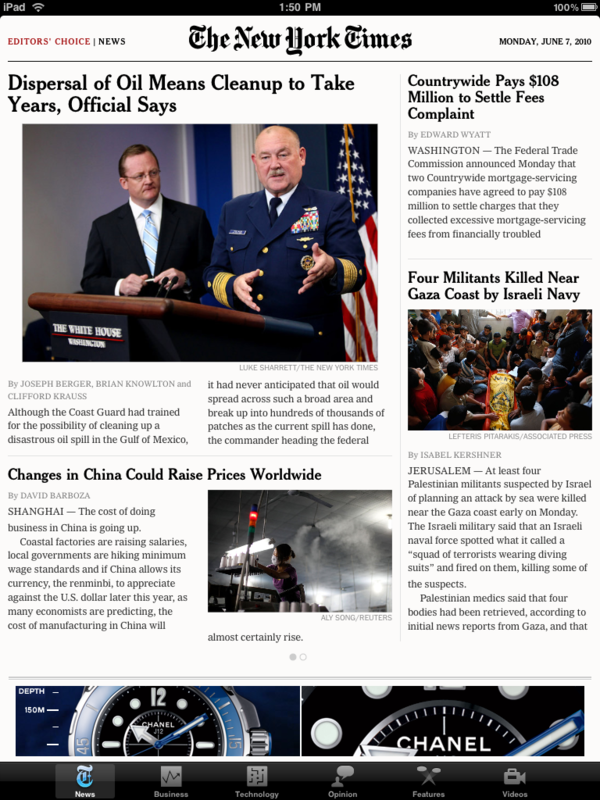 For those who have the free New York Times Editor’s Choice application for the iPad, the bottom of the page will now show a scrolling advertisement for the J12 Marine. The campaign actually incorporates three unique different ads that scrolls across a banner on one’s iPad screen. The ad gives the option of launching a submarine-esque ninety second video as well. The ad allows users to control the Chanel content they see by sliding down over the banner to observe the different J12 models from different angles. After the iPad user has viewed each of the three available models, the option to find a Chanel store locator is presented. The watches themselves are fitted with specially sand-blasted ceramic and steel on the case and clasp. There is a steel notched rotating bezel and a steel, screw-down crown with ceramic cabochon. The watch face is sapphire crystal, with blue anti-reflective coating on each side to ensure no glare. The dial shows a black lacquer with luminescent hands for better readability in the dark. The J12 Marine is a self-winding, mechanical Swiss movement with a 42-hour power reserve, and is available in black, blue, and white. The watch is further designed to withstand a descent up to 300 meters, or 984 feet. Litman further explains that the advertisement for the J12 is being marketed through the iPad application because iPad users fall into about the same consumer demographic as Chanel buyers. “We’re seeing early adopters who want the best of the best, whether it be the latest and greatest jewelry accessory or the newest and most technologically advanced tablet computer,” said Mr. Litman on the matter. This advertising method allows for luxury brand Chanel to maintain their aura of lavishness and comfort while adding to the appeal of the new and convenient Apple products being rapidly launched each year. The purpose of the ad is really to get users to spend as much time exploring the interactive method as possible. These expansions in the advertising industry should be expected to increase in the near future, especially with luxury brands such as Chanel wanting to push hot new products, but wanting to keep the consumer interested and not annoyed. Like all things artistry, Chanel watches begin with intricate sketches from the designers. The inspiration is then conveyed through various machinery; making Chanel watches not only unique, but also timeless. The diamonds and other precious stones are exclusively placed with a tiny tweezer like instrument into the outer face of the watches, which explains the very high pricing of a Chanel watch. Chanel’s J12 Diamond watches are nothing less than beautiful. 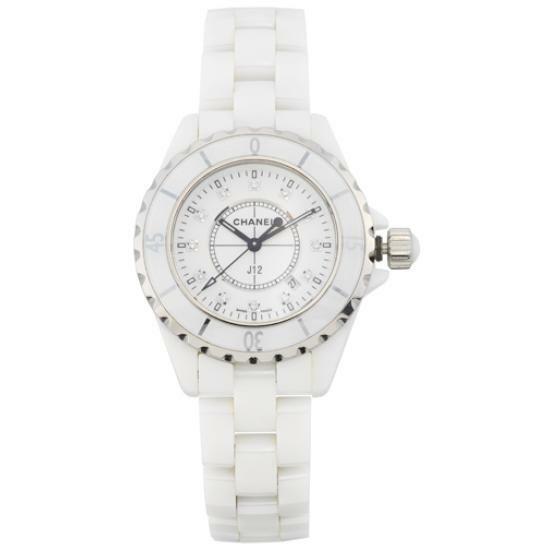 One of the watches in the “Jewelry” collection is all white, with diamonds lining the outer edges of the face. There are also diamonds where each of the numbers should be. The J12 Jewelry watch also has a spot for the numbered date on the bottom. It’s turning wheel is of the most polished silver, giving the watch as a whole an elegant and princess-like feel. The J12 classic watch is not much different from the jewelry watch in color, but it is very different in other aspects. This watch is also all white, except for the black hands and numbers that contrast nicely. J12 also makes a chronograph collection, and they are equally as beautiful and tasteful. One particular model is black, with black hands and a silver face. It has two timers in the center to give it that chronograph feel of a stopwatch. Chanel’s J12 Jewelry watch in diamonds. The J12 GMT watch is dark. It is almost entirely black, even the inside of the face. It does have white numbers and hands however, which is a nice contrast to the all blackness of the GMT. The Marine collection in J12 holds true to its name in color. The outer edges of the fact are a bright, cerulean blue. The only number you can see on this particular watch is the number twelve; the rest of the numbers are indicated by large circles and notches. The wristband on the Marine watch is a light black color. The hands on the watch are oversized arrows, giving the Marine a very exclusive look. The J12 Chromatic watch is the last in the collection. This particular watch is silver all around, including inside the face. The numbers and the hands are white, which is a nice contrast, but not too dramatic. Matchless to Chanel is their line of “Jewelry watches.” One watch in particular is a huge flower like emblem in gold and diamonds. This particular piece is absolutely breathtaking. Chanel also makes watches for men.